Most of my water-based training in Serendipity has been on my home patch of the blue stuff, Rutland Water – owned by Anglian Water who are my latest Silver sponsor to join the merry crew. Not only are they storing my boat and generally keeping an eye on her, but the folks at Rutland Watersports also help me get her in and out the water – and are generally a lovely bunch of super helpful folk. Anglian Water are also sponsoring my water-makers which are funky bits of kit that I will use to desalinate sea water into drinking water. Marvellous idea. So I am super glad to welcome them to the team and very grateful to have such top class local support. I was chuffed today to row with some of my old friends from Rutland Canoe Club – who paddled out with me in their kayaks, bringing back happy memories of years gone by. You see, I learned to paddle at RCC and did a few trips here and there as well – my favourite being the week spent in the Hebrides when I should have been revising for my AS level exams. 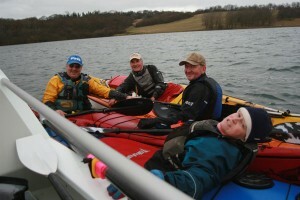 Happy days – so here’s a hello to my old canoeing pals too!